The Materials Engineering Branch has been serving the Goddard community for over 40 years. 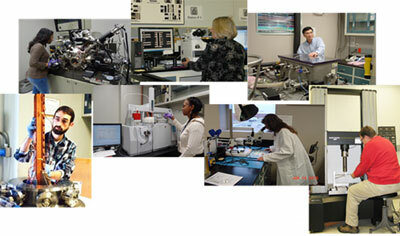 By maintaining a workforce encompassing a wide technical diversity including expertise in Chemical Engineering, Chemistry, Electrical Engineering, Materials Science, Mechanical Engineering, and Metallurgical Engineering, and Nondestructive Evaluation the Materials Engineering Branch is able to resolve many of the unique materials and processes specific challenges routinely encountered by Goddard Scientists and Engineers. The suite of technical instruments employed to facilitate much of the support activities performed by the Materials Engineering Branch has been tailored to meet the specific needs of the Goddard community. In support of flight projects, the Branch provides materials and processes engineering support, technical consultation on materials applications and processes, analytical laboratory investigations to solve organic and inorganic materials related issues, life testing and design qualification in anticipated service environments, and failure analyses. In support of research activities, the Materials Engineering Branch conducts applied research in materials technology and development to meet the future needs of GSFC spacecraft, instrument and technology programs. Utilization of the Materials Engineering Branch services are not restricted to science and engineering applications but are routinely used by Safety, Chemical Hygiene and the Facilities Management organizations. Materials Engineering Branch personnel take pride in their ability to "Enable Mission Success through Problem Resolution.